FC Goa emerged as champions of the Hero Super Cup after defeating Chennaiyin 2-1 in a tense final at the Kalinga Stadium here Saturday. Ferran Corominas opened the scoring in the 51st minute with a simple tap-in, while Raphael Augusto’s deflected effort brought Chennaiyin back level. Brandon Fernandes scored a goal befitting of a title winner in the 64th minute to seal the contest in Goa’s favour. Despite Goa being billed as the favourites to take home the crown, it was Chennaiyin, who started the game as the better of the two sides. Rafael Augusto, Anirudh Thapa and Dhanpal Ganesh controlled proceedings from midfield. As the game crossed the 20-minute mark, Chennaiyin started imposing bundles of pressure on the Goa defence. They created three consecutive chances in a space of three minutes but could not make any of them count. Augusto’s effort from Thapa’s cutback was brilliantly blocked by Mourtada Fall, denying an almost certain goal. From the resulting corner, defender Eli Sabia had a chance to break the deadlock but his fierce near-post shot was well saved by Mohammad Nawaz in goal. The young goalkeeper was given no respite as he had to prove his fine shot-stopping abilities when Ganesh’s header seemed destined for the far post. Slowly but steadily, Goa started gaining a foothold in the game and could have scored if not for some questionable finishing from Jackichand Singh. The winger only managed to sky his effort after some clever work from Hugo Boumous down the wing. In the end, both sides went into the break without finding the back of the net. In the second half, Goa drew first blood through their mercurial forward Corominas. After Thapa cheaply gave the ball away near the halfway line, Boumous drove towards Chenaiyin’s goal, before forcing Karanjit to make a save. However, the rebound fell perfectly to the Spaniard, who had the simple task of tapping the ball home. Just as it seemed that Goa would run away with the tie, Chennaiyin drew level. Raphael Augusto pounced on a loose ball just outside the box, firing a shot which took a massive deflection to deceive Nawaz. However, the Gaurs didn’t let the goal deter them. Corominas was once again at the heart of the action as he picked up the ball 30 yards from goal and released Brandon with a perfectly weighted through-ball. The small-statured winger was quick on his feet as he beat Mailson Alves and Karanjit to slide the ball home – a truly remarkable goal. As the match reached its final quarter, Goa could have sealed the tie when Boumous once again let Jackichand through. The winger had only Karanjit to beat but could not make the most of it. The rebound fell to Corominas, who was brought down inside the box. However, the referee waved away Goa’s claims of a penalty, instead pointing towards a goal-kick for Chennaiyin. 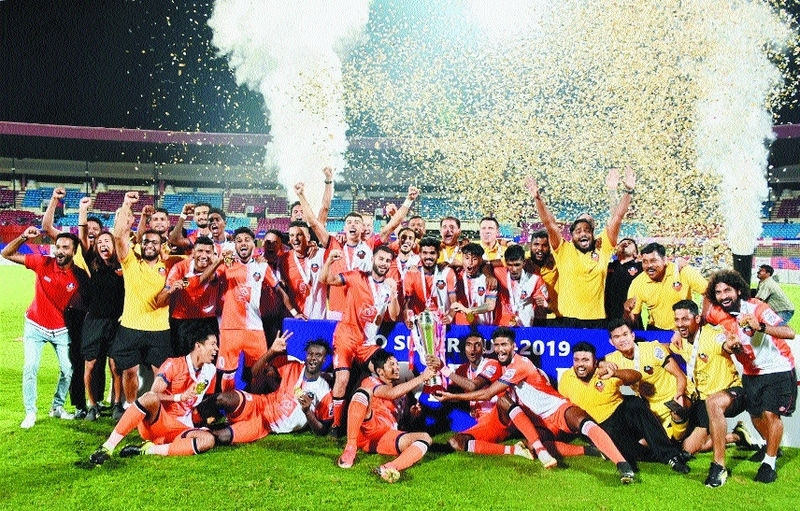 Nevertheless, it proved inconsequential as Goa held on till the final whistle to claim their first-ever Hero Super Cup trophy.